Published by the British Phycological Society. This edition was limited to 200 numbered copies and has now sold out completely. Published April 2003. Hard-cover (A4) in blue cloth with colour dust-cover, 437 pp, 629 maps, 2 figs, 2 tables. 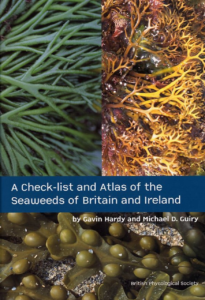 This book includes a check-list, in taxonomic order, of 642 seaweeds referred to the classes Rhodophyceae, Chlorophyceae, Phaeophyceae and the genus Vaucheria(Xanthophyceae) from Britain and Ireland together with maps of most entities plotted on the 10-km-square national grids by the Biological Records Centre. Maps are based on records submitted by members of the British Phycological Society Mapping Scheme since 1971 and various surveys, including those carried out by the Nature Conservancy Council (UK), the Joint Nature Conservation Committee (UK), the Sublittoral Survey of Northern Ireland, and the BioMar Intertidal and Subtidal Survey of the Republic of Ireland together with herbarium and field records from a number of sources. The 629 seaweed maps include over a quarter of a million individual records from 1361 of the approximately 1570 10-km squares covering the coastline of Britain and Ireland, including offshore islands and structures such as oil and gas rigs. There are 1240 squares with 1-99 entities reported, 182 with 100-199, 20 with 200-299; only two have more than 300: Lundy Island off the coast of North Devon, south-west England (310), and the area around Finavarra, Co. Clare, Ireland (336). The maps were created using DMAP.